Ukip leader Paul Nuttall. ‘We are now in with a realistic chance of breaking the political cartel in Westminster.’ [Image: Ray Tang/Rex/Shutterstock]. Having broken the UK’s political consensus over the European Union, we are now in with a realistic chance of breaking the political cartel in Westminster. 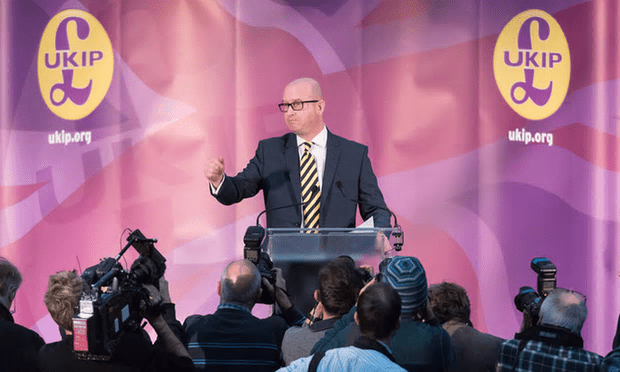 With Paul Nuttall’s election as Ukip’s leader, many on the political left are at last waking up to the existential threat the party poses to Labour in its own backyard. For years, Labour MPs scoffed at our determination to get Britain out of the EU. Many now realise we spoke for the majority of their own constituents. Labour strategists attempted to portray us as diehard Thatcherites. In reality, Ukip is often more in tune with the hopes and aspirations of ordinary Labour voters than their own party in Westminster. Ukip’s strategy is now to go after once-safe Labour seats with a new unity of purpose. A former Conservative thinks UKIP is in tune with Labour voters? That’s so ridiculous I can hardly bring myself to type the words. Carswell – and his new leader Paul Nuttall – are living in a fantasy world if they think they can even touch Labour’s heartlands. Labour has more than half a million members who are energised, enthusiastic and keen to spread a new kind of politics. Nuttall couldn’t even manage 10,000 to vote for him in his crummy little single-issue party’s leadership election. And he’s a former Tory – as is his party chairman and most of its leading lights. 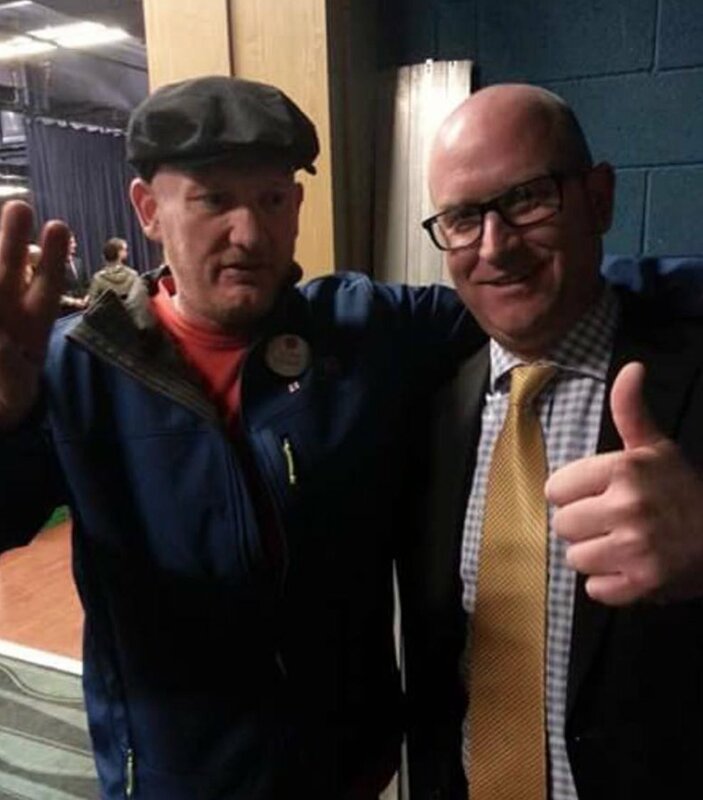 The EDL’s Andy Edge with Paul Nuttall of UKIP [Image: EDL News]. UKIP won’t make any headway in Labour heartlands. Still, they might manage fractionally better than Labour, if that party decided to move in on UKIP heartlands – for the simple reason that UKIP doesn’t have any heartlands. No doubt some Kipper will comment that I must be worried to have written at such length about these goons. Let them. I am worried – but only that they will find people gullible enough to be fooled by this nonsense propaganda. With help from the BBC and the Guardian, no doubt – not to mention UKIP’s usual friends in the Mail and the Express. All are now right-wing news media so do not be fooled; they don’t have your best interests at heart. Mostly, though, I thought Vox Political readers would enjoy a good belly-laugh at the expense of this silly gang of cut-price Mosleys and their new Fuhrer. 63% of Labour voters voted to remain, so only 37% voted to leave the EU, but many (if not most) have said they’ll still vote for Labour. UKIP have achieved their aim and no longer have any relevance. Well the referendum slips didn’t ask you which party you supported, and the majority of the votes to leave were in the Labour heartlands so we can accept that this claim is just fiction. Are you really trying to tell us you are so stupid that, after being told many times, and shown how to look up the facts, that more than two-thirds of Labour members and supporters voted Remain, you are STILL promoting a boneheaded and frankly idiotic claim that most Labour supporters voted Leave? Both Nuttall and Carswell are a nasty pieces of work. Its as simple as that. You could say that about every politician in the world, they don’t do it for altruistic reasons and if you believe any of them do then more fool you. Luckily for all of us you are quite wrong and there are many politicians at all levels and in many parties who honestly want to make a positive difference. Yes there are a few who are in it for their own gain but in my experience these are the venal minority. And yes I do know what I’m talking about as I know many politicians at all levels. Who said that if you must tell a lie make it a big one. Also someone said that the bigger the lie said loudly and often enough the more people will believe it. Garage built a party on this theory and a Trump is now the president elect despite rarely saying anything that wasn’t a downright lie so Nuttall is probably on to a good thing here unless everyone immediately shoots down his lies on every news platform. It didn’t work for cameron claiming he had got a very good deal for the UK although he hadn’t got one at all, only the minority believed the pro eu propaganda and threats of the nation being engulfed by the ocean if we left europe, although europe is a continent that we can’t leave, of which the eu is only a part. Do I recall the LibDems, several decades ago, under Diddy David finishing their conference with the flourish “go home and prepare for power”? That left them the laughing stock for many years!! Well there is truth to it. Very right-wing idea and doctrines can be appealing to naive simple people looking for naive simple answers to being downtrodden. Oswald Mosley used to recruit fascists from the east end of London, not from the drawing rooms of the people he normally abided with. Simple unsophisticated folk like a strong leader and the right-wing, which brooks no compromise, has an appeal to a particular “working class” mindset. Hence Farage (liar and idiot) and now Trump (liar, idiot and swindler). I doubt Nuttall is the man to pull it off but it can happen and has happened historically. Anti EU Tories and ex Tories in UKIP fooled many into thinking leaving EU was about immigration because many think the EU has anything to do with non EU immigration or asylum, when Nigel Farage and other Thatcherite ex Tories in UKIP will probably rejoin Tories to live in luxury while Farage keeps paying his foreign wife on expenses to increase household finances. They wanted to leave the EU because it’s preventing the few at the top mistreating most British people, such as making companies label GM ingredients and allowing workers enough breaks. Many will be so dumbed down by Express they won’t realise until more ex solders start dying from not affording to refrigerate their insulin. Why should we be scared of the EU when Tories have harmed far more British people? If anything the EU protects us against Tories destroying many lives and selling off British society, so only the upper classes and their tax dodging corporate donors who live in tax havens can make more money. As an English person I’m jealous that Scotland can now demand another referendum to leave the UK to become a separate nation in the EU, while here in England I expect the ex Tories in UKIP will rejoin Tories to make everybody hate England for reasons only few at the top gain from, Nigel Farage will keep employing his foreign wife on expenses while claiming he’s about immigration, and more ex servicemen will die from not affording to refrigerate their insulin. Then all the people who believed that anti EU Tories and UKIP care about most British people will be crying on Question Time. Sad how many believed the propaganda certain newspapers. Anti EU Tories and UKIP just don’t want anything in the way to mistreat British people, such as making companies label GM ingredients. Look at USA section in supermarket, to see EU compliant labels over original USA ones have a lot more information about ingredients. They want us to be like USA where they put wood shavings into cheese. It’s the ‘laughing sailors’ video, if you’re wondering whether to click on it or not.